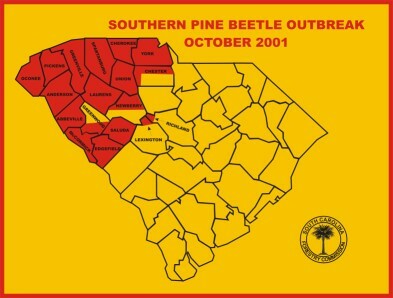 During 2001 . . .
Dollar losses to southern pine beetle have reached $76 million, the second highest level in SC history. If placed end to end, the trees killed by the southern pine beetle this year would reach around the world 1.6 times. Beetles killed enough SC timber to build about 16,000 average-sized homes. Almost all the southern pine beetle losses this year have been concentrated in the upstate. More than 5 million pine trees have been killed, mostly in 18 upstate counties. Highest losses are in Spartanburg County; beetles have killed $22.2 million worth of timber. Second highest losses are in Oconee County with $10.3 million in timber killed. Union County ranked third in losses with just over $10 million lost. Infestations have been discovered in Horry County, an area so far unaffected by the pest. Information updated October 30, 2001.